Gasoline price is $2.74 per gallon. This is the least expensive I've seen today. 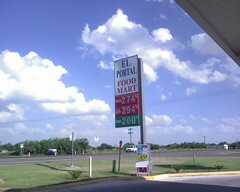 This is a convenience store just North of Alton, Texas. Elsewhere, it is $2.82 per gallon.